The Bureau of Meteorology (BOM) has issued a severe thunderstorm storm warning for Sydney and surrounding areas this evening, with the possibility of flash flooding, damaging winds and giant hailstones. BOM first issued the warning at 3:00pm this afternoon, with a number of severe storms crossing central western NSW. Hail 3 centimetres in size was reported at Blackheath, in the Blue Mountains area, and multiple towns across NSW have reported heavy rainfall. Although the warning remains, at about 5:00pm BOM said the severe thunderstorms in the warning area had eased temporarily. 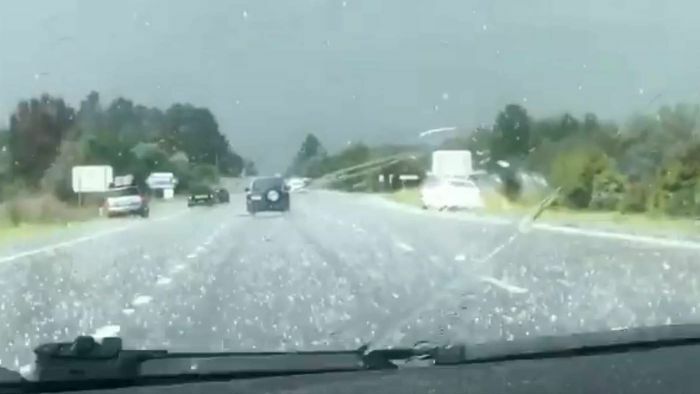 Footage emerging from the Blue Mountains on Wednesday afternoon shows large hailstorms falling to the ground with strong winds and heavy rain. The warning was issued for a broad area, including the following regions: Illawarra and parts of the Hunter, Metropolitan, South Coast, Central Tablelands, Southern Tablelands and Snowy Mountains districts. Locations which may be affected include Penrith, Nowra, Bowral, Braidwood, Katoomba and Goulburn. Other severe thunderstorms were detected on the weather radar near the area west of Berrima, Moss Vale and the Stroud district. The State Emergency Service is advising people to move cars under cover or away from trees and to secure or put away loose items around the house, yard and balcony. The cloud formation known as mammatus — meaning “mammary cloud” — formed over parts of Sydney is drawing a wave of online admiration. The clouds are a cellular pattern of pouches hanging underneath the base of a cloud, and are generally associated with storm activity. Insurers are also reportedly sending text messages to policy holders, advising them to move cars indoors. It comes after Sydney was hit with hailstones the size of cricket balls during a storm on December 20, causing hundreds of millions of dollars worth of damage to vehicles and property.